Sundowners Syndrome generally affects sufferers of Alzheimer’s disease and dementia. 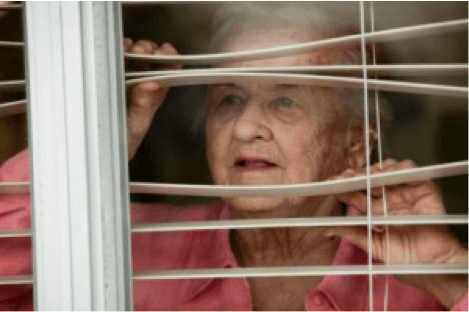 The syndrome received its name because the symptoms are exhibited after “sundown.” However, not all those who suffer from dementia exhibit the symptoms. Sundowners largely remains a mystery to medical science, but there are a number of theories as to why the symptoms present themselves at night. Some believe it is the culmination of all the sensory stimulation that occurs throughout daily routine that overwhelms and causes stress. The syndrome may prevent sufferers from settling in during the night and getting a much needed good night’s sleep. This can make the sufferer agitated and lead them to wander. According to WebMD, sundowning happens to almost 20 percent of people with Alzheimer’s disease or other forms of dementia. The syndrome tends to peak during the middle stages of Alzheimer’s, although it generally gets better as the disease progresses. Keeping loved ones active throughout the day may help them sleep better at night. Discouraging daytime naps may help as well. Encourage physical activity, like walking and hobbies to get your loved one moving about. It is important that your loved one is eating a balanced diet. The caregiver or meal planner should limit caffeine and sugar to morning hours only. Plan an early dinner and allow only light snacks before bedtime. A doctor can examine your loved one for physical ailments like infection, pain and bladder problems. Bladder problems tend to contribute to nighttime agitation and confusion. The doctor should also regularly review medications to make sure they’re still needed. Evidence would suggest that there is a correlation between sundowners and SAD (Seasonal Affective Disorder). Light therapy and exposure to natural light during the day may reduce some sundowning symptoms. When combined with exercise, it can be more effective. Keep the room partially lit to help reduce confusion when your loved one wakes during the night. Allow them to sleep where they find comfort, like a favorite chair or couch. Gently remind your loved one where they are and what time it is and avoid arguing. Let them know they are okay. As a caregiver it is important to be aware of the behavioral patterns. Help your loved one through reassurance while encouraging activity to distract them and prevent confusion and agitation. Sundowners is not something that your loved one can control, but keeping a level head will help get you through the stressful moments. For more information on quality care of a loved one click here.